We are a provider to offer the option of automatically encrypting your incoming e-mails. This means they are secure in your inbox and can be decrypted and read only by you. 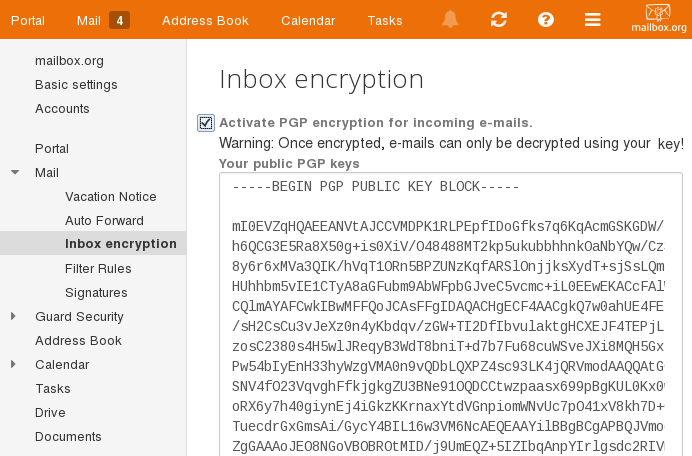 The e-mails contained in the encrypted inbox are encrypted using PGP. As you learned in the first doodle film, the message’s sender, recipient, and subject line are not encrypted. This is not possible with any of the encryption methods currently available. Also note that e-mails you compose with your mail client and save to the Sent folder are unfortunately not encrypted at the moment. We are working on a solution to this issue, which should available in the medium term, as we need to wait for the release of a specific software version. As a workaround, you can encrypt the e-mails themselves and send them as BCC. All popular e-mail programs offer a BCC copy for outgoing messages. You can then use a Sieve mail filter to filter these (now encrypted) e-mails to go to the Sent folder. You may activate your inbox encryption in the Settings pane at Mail - Inbox encryption. Paste your public key in the text box and enable the option Activate PGP encryption for incoming emails. The encryption is realised via Sieve Mail filter. Go to Mail - Filter Rules to find the corresponding rule. Please remember that any new filter rule that you create must be inserted after the encrypted mailbox rule.